This page provides instructions on how to update the firmware for Digital Photo Frame DPF-XR100 and DPF-VR100. - If the version is displayed as 1.13 or lower, update the firmware in accordance with below procedures. - If the version is displayed as 1.22 or higher, you do not need to update the firmware. It corresponds to 60p/50p videos shot with a Sony digital video or Sony digital still camera. Improvement of compatibility of video files that can be played back. *A CompactFlash card can be used with the DPF-XR100 only. Refer to About the memory cards in the Digital Photo Frame Handbook for details about compatible storage media. This is the dedicated update file for DPF-XR100 and DPF-VR100. You cannot use this file with other Sony digital photo frame. Save the file XR100_V122.zip to your desktop. Right-click the downloaded zip file XR100_V122.zip. The XR100_V122 folder is now open on your computer's desktop. Double-click the saved file XR100_V122.zip. The XR100_V122 folder is created on your desktop. The extracted XR100_V122 folder contains the following update files. The XR10001.VUP update file is the same for both DPF-XR100 and DPF-VR100. Use the XR10001.VUP if you wish to update the firmware of DPF-VR100. We do not recommend initializing (formatting) with a computer, as the DPF-XR100/VR100 may not recognize the storage media, depending on the type of initialization format. If you have no choice but to use a storage media that has been initialized with a computer, copy a JPEG image file and check to see if it is displayed correctly on the DPF-XR100/VR100 . Open the XR100_V122 folder on your desktop, and copy the update file inside it to the Memory Stick™/Memory Stick Duo™. Open the XR100_V122 folder on your desktop, and copy the update file inside it to the Memory Stick™/Memory Stick Duo™ that you have inserted into your digital camera. Also ensure that the Memory Stick™/Memory Stick Slot™ is firmly inserted into the Digital Photo Frame during the update so that it cannot fall out. If the above display does not appear on the LCD screen after at least 3 minutes or if the display is distorted, remove the AC adaptor from the Digital Photo Frame and reconnect it. Next, make sure that the (Power) button is green, press the (Power) button to power off. Check that the (Power) button is red, and start the update process again from update the firmware. Press the button to select Update firmware and press the (ENTER) button. Check that the following message is displayed on the LCD screen. Press the (ENTER) button. The LCD screen changes to the following display. If the above display does not appear on the LCD screen after at least 3 minute or if the display is distorted, disconnect the AC adaptor from the Digital Photo Frame and reconnect it. Next, make sure that the (Power) button is green, press the (Power) button to power off. Check that the (Power) button is red, and start the update process again from update the firmware. The LCD screen changes to the following screen, and the firmware update is performed. It takes about 3 or 4 minutes to write the firmware. Make sure the Memory Stick/Memory Stick Duo is firmly inserted so that it does not come out during the update. Turning off of the digital photo frame power or if the Memory Stick/Memory Stick Duo comes out during the writing of the program, it may cause a malfunction. Cause: The file is not in the Memory Stick™/Memory Stick Duo™. Action: Check that the correct files have been copied to the correct location on the Memory Stick™/Memory Stick Duo™, and redo the procedures in update the firmware from the beginning. Cause: The Memory Stick™/Memory Stick Duo™ has fallen out during the update. Action: Click Explanations on program update below and read its recommendations. Action: Click Explanations on program update to display the information. When the "Completed" message appears on the LCD, press the (Power) button to turn off the power of the Digital Photo Frame. When your photo frame does not start in a few minutes, Click Explanations on program update on the screen to display the information. Check the firmware version is displayed as 1.22. IMPORTANT: When something other than 1.22 is displayed in Version, or when nothing is displayed (blank): The firmware was not updated correctly. Perform the update again from the beginning, following the update procedure. 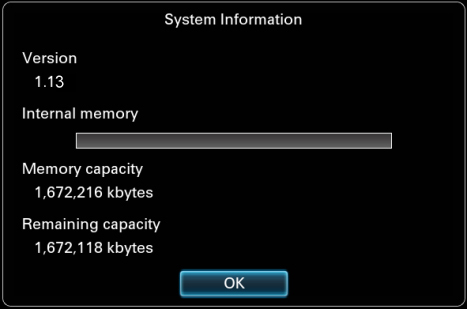 The update file in the Memory Stick™/Memory Stick Duo™ is not required after the update. The update file can be deleted. Perform the procedure below if any of the following occurs while you are updating the firmware of the digital photo frame DPF-VR100 or DPF-XR100. An error message such as, Update failed. See Explanations on program update shown in the figure below appears. The power turns off during the update. The digital photo frame cannot be started after the update. Turn off the power of the Digital Photo Frame and disconnect the plug of the AC power adaptor from the back of the digital photo frame. Note: If the power does not turn off even when the power button is pressed, disconnect the plug of the AC power adaptor from the back of the digital photo frame. Check that the memory card to which the update file was copied is inserted correctly into the digital photo frame card slot. While holding down the VIEW MODE button, connect the plug of the AC power adaptor to the DC IN 9V jack on the back of the digital photo frame. The digital photo frame turns on in maintenance mode. Redo the procedures in update the firmware from the beginning. Note: The operation will not be performed correctly if the power is turned on as normal. Be sure to follow the procedures above to turn the digital photo frame on in maintenance mode.